Shortly after the second World War the United States Government began sponsoring a series of tests to find a new pistol to replace the Colt M-1911A1. One of the key requirements dictated at the time was that the pistol was not to exceed 7.0 inches in length or 25 Ounces in weight. These tests were conducted at Aberdeen Proving Grounds as well as in Fort Benning, Georgia. The pistols submitted at this period was the S&W M39, the Colt Commander, a modified Inglis Hi Power, a FN Hi Power and the T3 all chambered in 9mm Parabellum. The T3 was a new design which was a blowback automatic, it utilized a heavy spring encased around the barrel to help reduce the recoil of the pistol when fired. The weapon was made from a lightweight alloy to help reduce weight and meet the requirements. When the weapon is empty the magazine is exchanged by depressing the magazine catch at the bottom portion of of the receiver. The weapon did not do well during tests, however it has never been proven if t was truly a design problem or poor ammunition as the blowback method has been used in the past with other pistols (such as the Astra Model 1921). The Tests were eventually stopped by the Government as they felt none of the pistols were going to be a more suitable replacement for the Colt automatic. 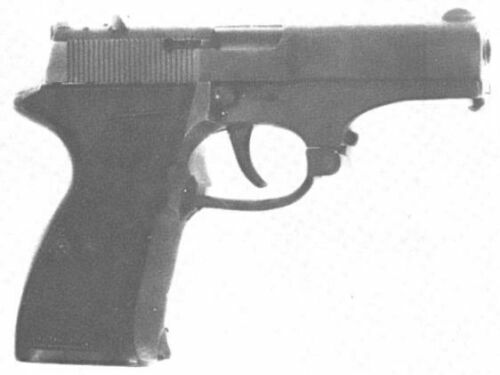 The T3 TRIAL PISTOL fired the 9x19-Parabellum round, feeding from a single-stack column 7-rounds magazine. Its weight was 1,94 Pounds.